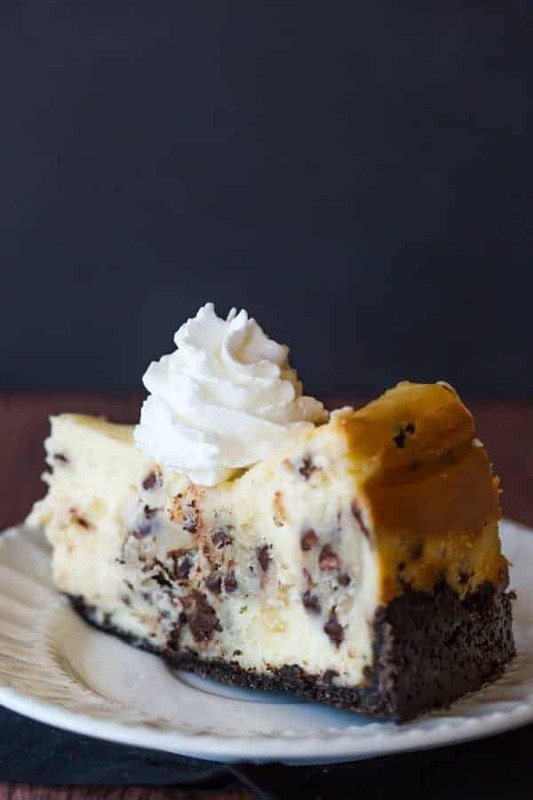 The best cheesecake recipe loaded with chunks of chocolate chip cookie dough and mini chocolate chips – a cookie dough lover’s dream! Cheesecake! My all-time, numero uno, will-choose-above-any-other-dessert, favorite indulgence. If I can combine cheesecake with chocolate in any form, even better! It’s been too long since I’ve shared a cheesecake recipe with you (last summer I shared a s’mores cheesecake and Oreo cheesecake), right? Given how popular my chocolate chip cookie dough dip has been, I got the idea in my head that pairing eggless cookie dough with my favorite cheesecake recipe would be absolutely divine. 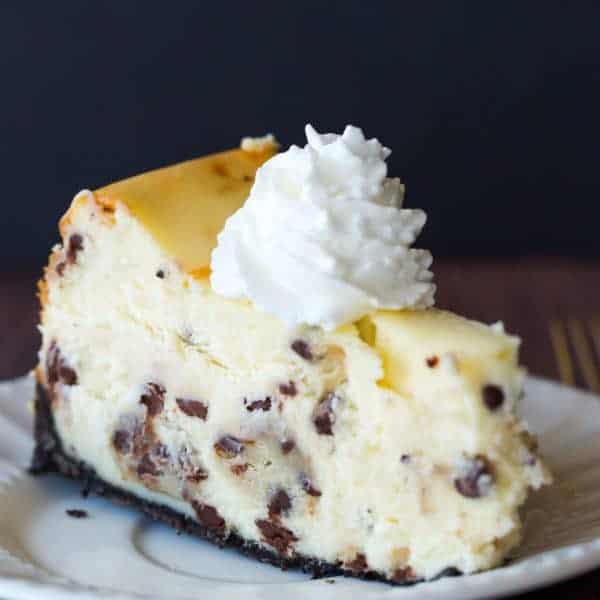 When my husband wandered into the kitchen last week and asked what I was making, I said, “chocolate chip cookie dough cheesecake!” My proclamation was met with a pretty lukewarm response, which stunned me because he is the king of chocolate chip cookie dough. I save a spoonful for him anytime I make cookies! I asked why he wasn’t more excited, given his love for cookie dough, and he said he just didn’t think he’d like the combination of cookie dough with cheesecake. Fair enough. Fast forward to the cheesecake being prepped, baked, chilled and sliced. I gave a piece to my husband to see what he thought, aaaaaaaand… he loved it. So did I! 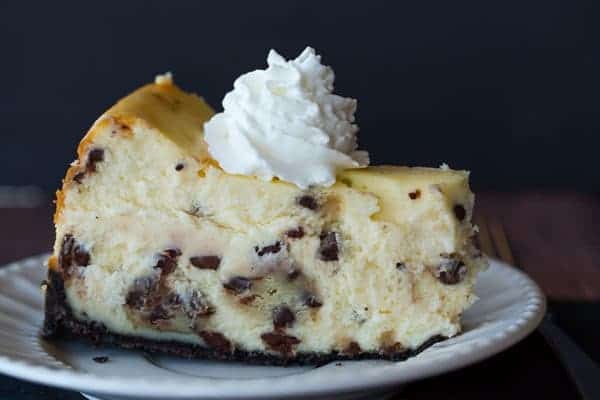 The cheesecake is loaded with mini chocolate chips so you get some in every bite, and then there are the large chunks of chocolate chip cookie dough… it’s the perfect complement to the smooth and creamy cheesecake. We’re less than one week from Valentine’s Day, can you believe it?! 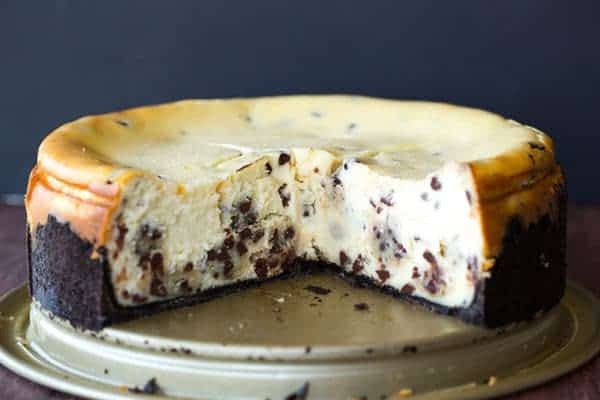 While there are tons of chocoholics out there who would totally appreciate something like a molten lava cake, if your significant other is a chocolate chip cookie dough fanatic, you owe them this cheesecake. They will be forever indebted to you! 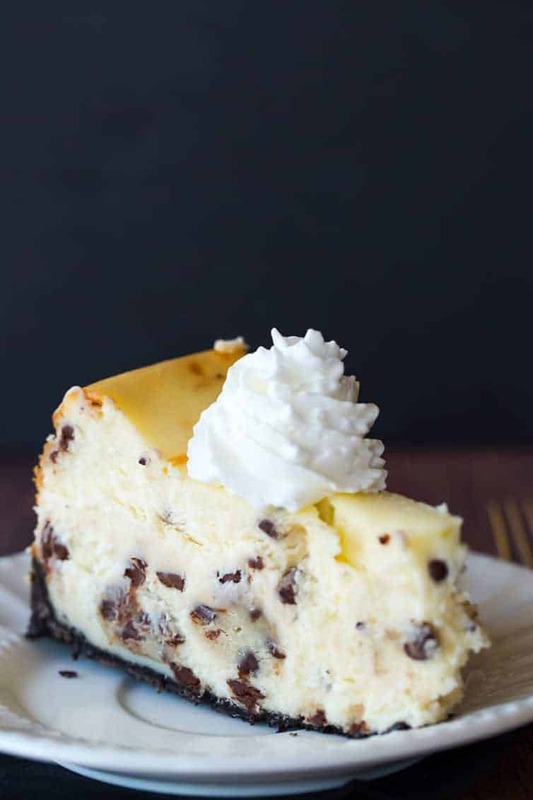 The best cheesecake recipe loaded with chunks of chocolate chip cookie dough and mini chocolate chips - a cookie dough lover's dream! Preheat oven to 350 degrees F. Grease a 9-inch springform pan; set aside. Make the Chocolate Chip Cookie Dough: Using an electric mixer, cream together the butter and both sugars until light and fluffy, about 3 minutes. Add the milk and vanilla and mix until blended. Reduce the mixer speed to low and blend in the flour and salt, just until combined. Using a rubber spatula, stir in the mini chocolate chip. Scoop teaspoon-size portions of the dough and place on a large plate (you can roll them into smooth balls if you'd like, but it's not necessary). Place in the freezer while you prepare the rest of the cheesecake. Make the Crust: In a medium bowl, stir together the Oreo cookie crumbs and melted butter with a fork until evenly moistened. Press into the bottom and halfway up the sides of the prepared springform pan. Refrigerate while you prepare the filling. Make the Cheesecake: Using an electric mixer on medium-low speed, beat the cream cheese, sugar, flour and salt until the mixture is creamy and no lumps of cream cheese remain, about 3 minutes. Scrape down the sides of the bowl, add the heavy cream and vanilla and beat to combine. Beat in the eggs and yolk one at a time, beating for about 15 seconds before adding the next. Using a rubber spatula, mix a few times by hand to ensure that all of the ingredients are evenly incorporated. Fold in the balls of chocolate chip cookie dough and the mini chocolate chips. Pour the filling into the chilled crust and spread into an even layer. Place the pan on a foil-lined rimmed baking sheet. Bake until the outer couple inches of cheesecake looks puffed and set, but the center still jiggles when you move the pan, about 45 to 60 minutes. Turn off the oven, crack open the door and leave the cheesecake inside for 1 hour. After an hour, remove the cheesecake from the oven, place on a wire cooling rack and run a thin knife around the edge of the cake. Allow to cool completely to room temperature. Once the cheesecake has cooled to room temperature, refrigerate for at least 4 hours, preferably overnight. 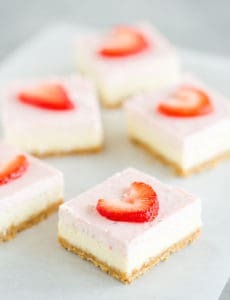 Remove from the refrigerator 30 minutes prior to serving, unmold the cheesecake and place it on a serving platter. Leftover cheesecake can be stored in the refrigerator for up to 1 week. Not sure if you will be able to respond in time… but I was so tired last night that I left the cheesecake out OVERNIGHT! About 9.5 hours after it came out of the oven. Our home gets down to 62 degrees at night. Is there a hard and fast rule on cheesecakes about how long they can sit out? I’m devastated, it looks so pretty! I live near Denver CO at 5400 feet…..any adjustments for altitude? Easy to make just a tad time consuming. Took the full time to bake. Beautiful and DELICIOUS! Used my extra heavy cream and made real whipped cream to do as topping. Also reserved 8-10 dough balls to decorate the top like another review said. Highly recommend and will make again. Everyone loved it. I made this cheesecake for my son’s birthday and it was AMAZING! I will definitely make it again. For the crust I only used 3 T of butter instead of 6 T because of comments of excess oil. The crust was perfect, no excess of oil. The cookie dough is delicious. Next time I will make smaller balls, 1/2 teaspoon size and will retain about 1/4 of them to decorate the top of the cake after I bake it. Thank you for an amazing recipe! Can’t wait to try this recipe! Question, did you use a light colored or dark colored springform pan? And do you need to adjust cookie temperature or time based on the color of the pan? Hi Sam, I use the Williams-Sonoma Goldtouch; it’s non-stick but not dark. If you use a dark pan, you’ll want to reduce the temperature to 325 degrees. Enjoy! Hi Claire, Oh no! I’m so sorry to hear that! I’ve never ever had that happen, but if the batter all poured out, it most definitely was not baked through (and not even close). Hi Claire, I don’t think that would work, as there is no leavening or eggs. It’s meant to be consumed without cooking, so I would stick to a regular chocolate chip cookie recipe for decorating. Should I cover it when I leave it in the fridge over night? Hi Krysal, No, it does not need to be covered (and doing so will cause condensation). Is it really 32 ounces of cream cheese as here we work in grams and that would be about 900 grams! Seems alot of cream cheese? Please help as I want to make today :)! Hi Kirsten, Yes, that’s the correct amount! Hi, I want to make this tomorrow but I wanted to know if I could replace the heavy cream with milk? Hi Cassy, I would not recommend it, the extra fat in the cream help to give the cheesecake a creamy texture. 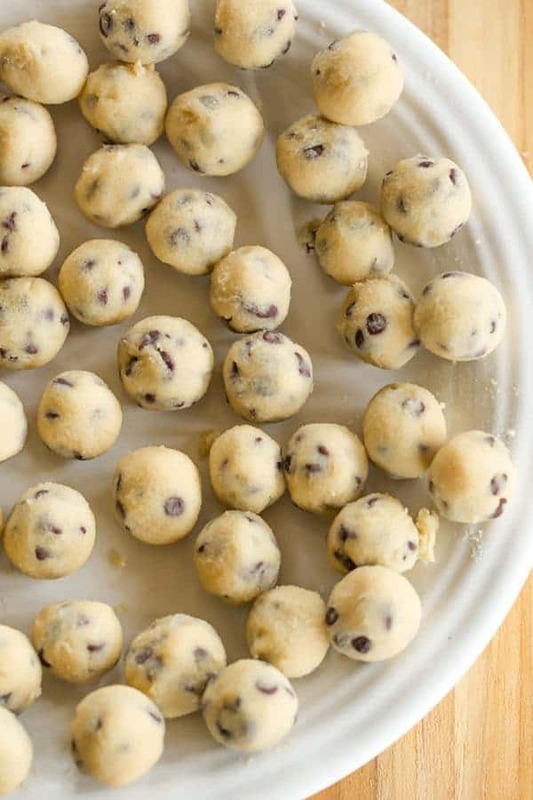 Can you use store-bought cookie dough for the mini cookie dough balls? Or it has to be from scratch and following the recipe? Hi Fatima, I would only use it if it’s safe to eat raw; I’d have to assume that most store-bought cookie dough has raw eggs. But isn’t the store bought cookie dough cook in the oven? Can this be made ahead of time and frozen??? Hi Amy, Yes, you can definitely freeze! Fantastic. I made this with a dark chocolate graham cracker crust vs oreo crust. I also made a homemade sour cream whipped cream for the top. It was delicous and a huge hit. In paragraph 2, it says to add flour and then in paragraph 4, it says to add flour again. I get adding the flour in the cookie dough, but I’ve never heard of flour in a cheese cake. Is the 1 1/4 cups of flour divided? If so, what is the division? This could be a rather costly mistake. My other question is, will this fit in a standard 9-inch springform pan? 32 ounces of cream cheese, plus the cookie dough is A LOT of filling! Hi Nancy, It is not divided. If you look under the ingredient list for the cheesecake, it includes 2 tablespoons of flour, which is separate from the flour in the cookie dough. 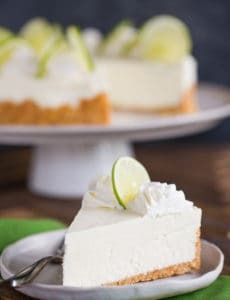 It’s not totally uncommon to see a small amount of flour or cornstarch in a cheesecake recipe – it helps to minimize cracking and also creates a more firm and sturdy cheesecake, which is helpful if you have add-ins or fillings. And yes, I use a standard 9-inch springform pan for this recipe. Mom made it for my birthday last week and it was theeee best! ? Can you make this with a store bought oreo crust? Would baking time/temp be different? Thanks! Hi Sarah, I’ve never seen a store-bought crust for cheesecake? Only for pies? I made this cheesecake today, and it came out perfectly! I baked it just shy of 60 minutes, then followed the rest of the directions to the letter. It was time-consuming but not difficult, and this was my first attempt at a cheesecake. I did have some oil come out of the bottom, as has been mentioned before but nothing on top. Since it is very rich, I plan to freeze some individual slices to pull out later. The taste is fresh, sweet, creamy, and amazing! Hi Elizabeth, So glad you loved this cheesecake! They should last a good couple of months, at least. I wrap each slice tightly in plastic wrap, then place in a ziploc freezer bag. I didn’t have any oil issue. I just made the cake. OMG. Can we wait for it to cool to room remp and then 4 more hours in the fridge. I think not. It might be 2. The cookie dough was divine before it baked so I know it will be great in the finished product. I baked it for 45 minutes and cooled as directed. It did form a big crack so I hope that isn’t a reflection of overbaking. It sure smells good. Hi Julia, It’s normal for some to pool on the bottom (from the crust), that’s why I have it baked on a rimmed baking sheet to catch anything that drips, but I’ve never had anything pool on top. If you had a cookie dough ball right beneath the surface, that could be why. I didn’t have any issues with the interior of the cheesecake, though! Do you think that this could be frozen after baking for storing? When do you incorporate chocolate cookie dough? It says put in the freezer and then there is no indication when you put a cookie dough? Do you put it before the filling, or you mix it with the filling? Thanks. Hi Yelena, My apologies for the omission; it’s since been fixed, but you mix it into the batter with the mini chocolate chips before pouring into the pan. If I could, I think I would eat this off the page right now! This looks delicious. I, too, am a cheesecake fan and tend to have cheesecake over just about any other dessert offering. Adding the balls of cookie dough to the cheesecake batter is a great idea. What a nice contrast of textures, and it has to be a burst of flavor to bite into that bit of dough. Can. not. wait. to give this a try! I can’t see the part where you incorporate the chocolate chip cookie dough into your batter. Did I miss that part? Hi Hava, It appears at the end of step #4. I loved the cookie dough dip, but then again I was always the one to lick my Mother’s baking bowls out when I was a child! 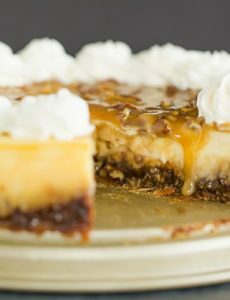 I have always loved cheesecakes too, so this has to be a winning combination and I will be giving it a try. I am sure it is just me, but I couldn’t see where the frozen balls came back into the recipe. I assume you mix them with the cheesecake filling but couldn’t see you explain this? Hi Lincoln, So sorry about that error! The cookie dough balls are added along with the mini chocolate chips at the end of step #4 – I’ve fixed the recipe above. No problem and many thanks for getting back to me. I am all over this after Whole30, but when do you add the cookie dough balls into the process? Hi Laketia, Sorry about that omission, along with the mini chocolate chips at the end of step #4 – I’ve fixed the recipe above. WOW! It looks incredible and sooooo yummy!